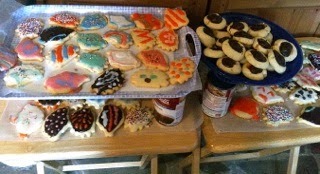 1) Set up a cookie decorating table and have some cookies already baked and ready to decorate. 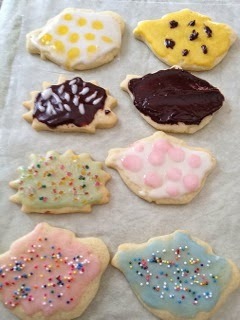 Our own family tradition is Wacky Teapots and Hedgehogs, made from a simple sugar cookie dough. We get some crazy artwork. 2) Have a place where people can drop their contributions. You'll go through enormous quantities of flour, butter, sugar, and eggs - just expect it and be ready. 3) Any horizontal surface can hold cooling cookies, including tables, trays stacked on soup cans, ironing boards, and open drawers with cutting boards on top. Be ready to get creative. If you trust those guys watching TV, you can even use the coffee table. 4) Have some tried-and-true recipes, and mix in some experiments. I've never had a cookie that was outright bad for everybody - someone always likes the weird stuff. Personal favorites: Cherry Bombs (recipe below), Wacky Teapots and Hedgehogs, Hermits, Thumbprints (recipe below), Gingerbread men/women/animals/blobs. 5) You can never go wrong with shortbread. 6) Gallon-sized Ziploc bags are the perfect size to hold a paper plate with a dozen cookies. 7) A good sugar cookie dough is the little black dress of baking. 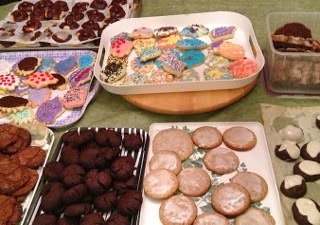 You can roll it out and use cutters, decorate like crazy, drop from teaspoons, form into balls and roll in colored and/or flavored sugar, use as the base for other cookies and bars. My favorite sugar cookie dough recipe is below. 8) Cookies baked on the Big Day can be - and, at my house, are - stored in airtight tins, ready to pull out for visitors, afternoon teas, and holiday parties. Plates of cookies are an always-welcome gift. May be doubled if you have at least a 5-quart mixer. Sift together the flour, baking soda, and salt - or at least pass it through a sieve! Cream the butter. Beat it with an electric mixer for at least 30 seconds, until it turns a pale yellow color. Scrape down the beater and sides of the bowl, add the sugar, and beat again 2 minutes or so, until it is soft and almost white. Scrape again. Add eggs and both extracts. Beat at medium speed about a minute, until it has the consistency of mashed potatoes. Stop and scrape again. Add the mixed and sifted dry ingredients and mix on low speed about a minute. Stop and scrape again. Mix a little more, until the dough sticks together and there are no streaks of unblended flour. The dough will keep, covered and refrigerated, for a week. It may be wrapped airtight and frozen. Bake cookies on parchment paper in a preheated 375˚F oven, until the edges just begin to brown. Divide the half-recipe of cookie dough into 36-42 one-inch balls. The simplest way is to shape the dough into a rectangle, and cut a cross-hatch: 6 rows by either 6 or 7 columns. Every dough ball should be the same size. Place the balls about 2 inches apart on parchment-lined cookie sheets. 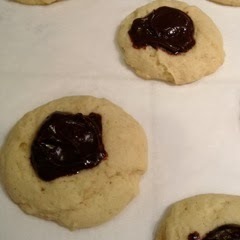 Make a deep thumbprint in the center of each dough ball, and put a drained cherry in each one. In a small saucepan, combine condensed milk and chocolate chips, and stir over low heat until the chocolate is melted. (you can do this in the microwave, too. Just don't let the chocolate scorch!) Add about 2 Tablespoons of the reserved cherry juice, and stir well to combine. Spoon about 1 teaspoon of this frosting over the unbaked cookies, covering each cherry completely. Bake at 350˚F 10-12 minutes, until the cookies are just beginning to show browned edges. Divide the half-recipe of cookie dough into 36-42 one-inch balls. The simplest way is to shape the dough into a rectangle, and cut a cross-hatch: 6 rows by either 6 or 7 columns. Every dough ball should be the same size. Place the balls about 2 inches apart on parchment-lined cookie sheets. Make a deep thumbprint in the center of each dough ball, and put a dab of jam in each one. I read your blog its really interesting and help full to me. I love Holiday Cookies. You share nice resource. I love Holidays cookies. Nice write up..!! I'm so glad you enjoy the blog! All of us at 37Cooks love cookies, and I'm happy to share these favorites with you. May you have lots of cookies for the holidays! All of us at 37Cooks love cookies - I'm very happy to share these favorites!